Twentieth Century Fox promoted The Three Stooges at several Six Flags Theme Parks across the U.S. 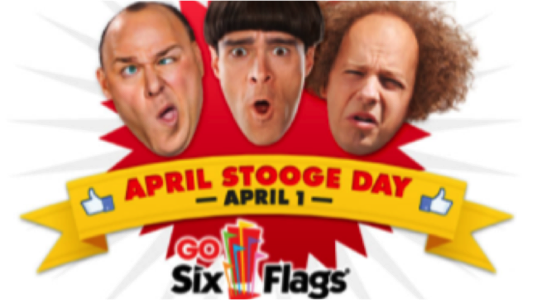 The program included a special “April Stooge Day” event on April 1st as well as placement on a variety of Six Flags Media Networks elements. Promoted on Six Flags TV, jumbotron, digital menuboard, counter cards, pole banners, and billboards. Secured 3 personalities from the Laugh Factory to serve as judges at the Six Flags Magic Mountain Look-Alike contest. Promoted on sixflags.com and in social media posts.